Features : General Features: • Connects USB 2.0 or USB 1.1 devices to your PC and Mac. • Hot Plug Capability • Connect up to 127 devices Data Rate: • 480 Mbits/sec Connectors: • 4 external auto speed selectable Type A USB ports, supports all USB speeds. • 1 internal auto speed selectable Type A USB port for use with USB 2.0 Hi-Speed or USB 1.1 devices. • EHCI based 480 Mbits/second USB 2.0 Hi-Speed compliant. • OHCI based 12 Mbits/second USB 1.1 compliant. 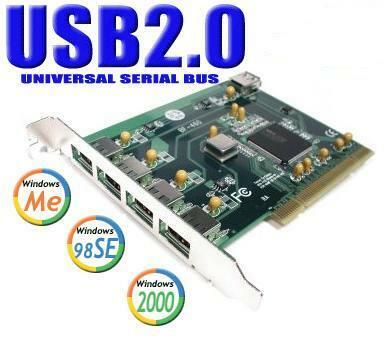 USB 2.0 Hi-Speed PCI Board is a dramatic performance increase over the standard USB. Whereas the USB 1.1 is only 12 Mbits/s, the new USB 2.0 specification USB 2.0 runs at up to 480 Mbits/sec.USB, standing for "Universal Serial Bus," allows you to attach multiple peripheral devices simultaneously with automatic device detection and installation. ONLY $39.50 5-Port Card PCI for Windows 98/ME/2000 and XP! ONLY $29.50 2-Port Card PCI for Windows 98/ME/2000 and XP!